Neb. May Play Key Role In Canada Pipeline Battle TransCanada's proposed Keystone XL oil pipeline would cut through the Ogallala aquifer, a major water source that supplies about 80 percent of Nebraska's water for drinking and irrigation. Legislators have introduced bills preventing pipelines in environmentally sensitive areas. Thousands of demonstrators ringed the White House on Sunday afternoon, demanding that President Obama deny permission for a proposed pipeline to carry crude oil from the tar sands of Canada to refineries in Texas. Business and labor groups support the Keystone XL project; many environmentalists oppose it. But deliberations in Nebraska may play a decisive role. There, lawmakers have introduced bills in response to concerns over the pipeline's projected path through an important source of water. One bill would prevent companies from building pipelines over certain ecologically sensitive areas; another would require pipeline companies to set up a $500 million indemnity bond in case of any leaks. We ask: Why would you risk an oil spill or leak over the aquifer when TransCanada already has a pipeline route on the eastern side of Nebraska? On one recent afternoon, a small crowd gathered in the vaulting rotunda of Nebraska's towering state Capitol in Lincoln. Light streamed into the space from arched windows high above, bouncing off the floor where a marble mosaic depicts Mother Earth yielding gifts of food and water. "Nebraskans live here because we choose to be here," Nebraska author Mary Pipher said about her state. "Our state is not glamorous, exciting or an easy place to make a living. What we have in our state is our history, our relationships, our land and our water." The occasion wasn't an abstract celebration of civic pride: It was a news conference preceding a special session of the Legislature meeting a few steps away to discuss the pipeline. Nebraska Gov. Dave Heineman recently reversed himself and called the Legislature into special session to deal with this issue. 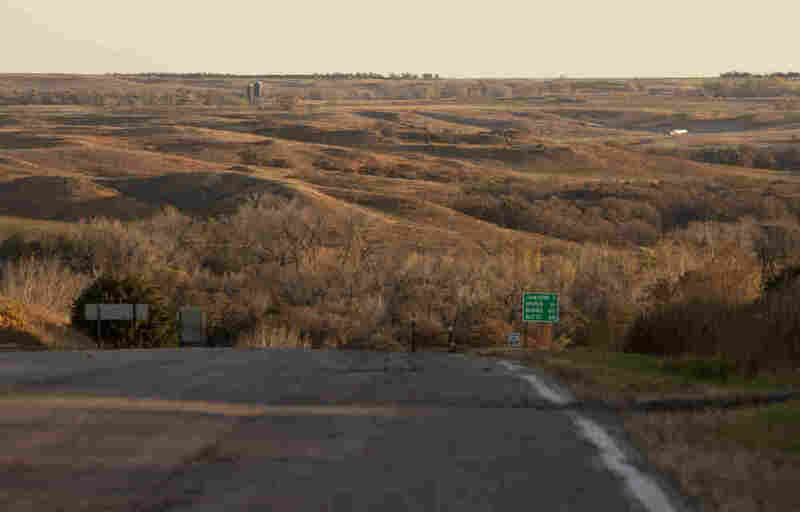 "Many Nebraskans, including myself, support the pipeline, but we are opposed to the route that goes through the Sandhills and over the Ogallala aquifer," Heineman explained. "We ask: Why would you risk an oil spill or leak over the aquifer when TransCanada already has a pipeline route on the eastern side of Nebraska?" The vast Sandhills in the northwest region of the state are home to more cattle than people. Beneath the grass-covered dunes is the Ogallala aquifer, which supplies about 80 percent of Nebraska's water for drinking and irrigation. Concerns over a pipeline carrying 700,000 barrels of oil a day through the aquifer have produced an unlikely coalition against it. "You have conservative farmers and ranchers, you have progressive environmentalists, you have independents who care about eminent domain and private individual property rights," says Jane Kleeb, who helps coordinate the opposition. The pipeline company, TransCanada, promises state-of-the-art safety systems. It complains that nearly three years into the federal approval process, it would now be impossible to change the pipeline's route. TransCanada spokesman Shawn Howard says opponents are just being unrealistic. "Anybody who looks at this objectively knows that we're decades away from being able to turn off a fossil fuel switch and flip on an alternative energy switch without affecting our quality of life," he says. TransCanada encountered almost no opposition when it built a similar pipeline across eastern Nebraska two years ago. That one skirted the Sandhills, though it crosses a small portion of the aquifer. But legislative Speaker Mike Flood, who opposed this special session, says the earlier pipeline was built before the Gulf of Mexico oil spill. "It's a different environment than it was even a couple of years ago," Flood says. The question remains whether it's different enough to persuade the usually pro-business Legislature to pass a bill aimed at changing the route. And if the Legislature does act, the almost-certain legal challenges could provide their own detour in getting Canadian oil to Texas.